While in college I had the opportunity to meet the CEOS of Chase Manhattan Bank and CNA Insurance. At 20 years old I was fascinated with how down to earth yet how powerful these executive were and as i escorted them from the student union to the auditorium to speak they all mentioned how important it was to have a solid network of colleagues and successful people around you to help you not just advance in your career but in life. Joining us for our discussion On How To Network Like A Successful CEO is Leon Shapiro who is calling in from his San Diego Office . 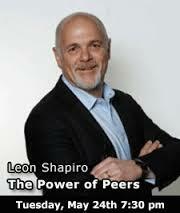 Leon Shapiro has served as a CEO of one of the leading peer advisory membership organizations , Vistage Worldwide and currently serves on their board of directors. Prior to that he was an executive at Warner Music Group, NPD And Gartner Inc.